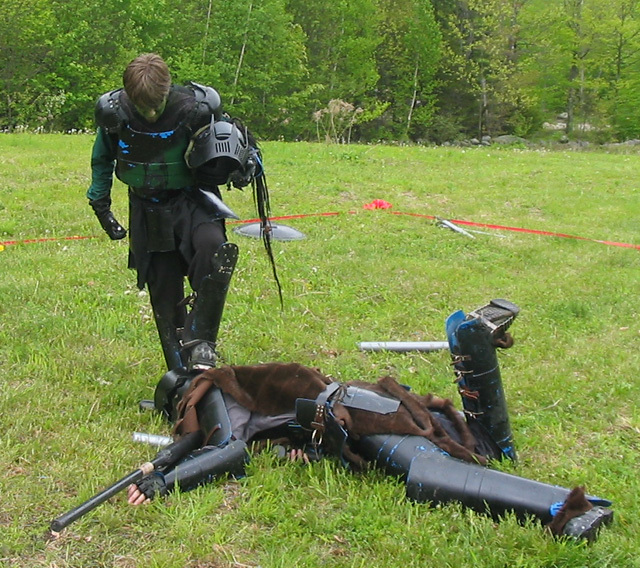 We know from Common Larp Weapons how we deal damage, but we should also know how to prevent it. 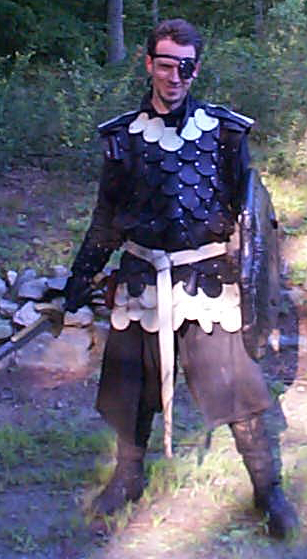 Armor is less universal across larps and there can be all kinds of major and minor differences. This is the rough outline for the rules of my 4x larp, check with your own game system before assuming they are the same. There will be many details which are different. The function of armor is to prevent damage. To do this armor covers the hit locations (we usually discuss these during practice, but maybe a post should cover that as well). If your opponent takes a swing at one of the hit locations and the armor gets between the blow and the body, the armor takes the damage. This reduces the durability of the armor temporarily. The armor then must be repair before it can stop blows again. In our system there are two kinds of armor available without adventuring; Flexible and Rigid. Flexible armor prevents a single point of damage before being rendered useless. Rigid armor can prevent two points of damage. Remember the protection only exists in the locations the armor actually covers. Hit an exposed bit of a torso, say in the joints of the armor, and the wearer gets no protection. Here we have a friend borrowing my armor. Here we have a lightly armored fighter. He has one point of armor covering most of his torso. Although there is no armor on his arms, there is a leather gauntlet on the sword arm. His legs have no armor coverage at all. Any hits to the upper arms and legs will get no protection from the armor. Hits to torso and lower left arm are protected from the first hit. Flexible armor comes in a few different forms. Leather armor is the most common form of flexible armor. Not garment leather, btw. Hardened leather scales, or leather plates, specifically designed for use in armor must be used. Suede alone will not stop a sword. Chain mail also falls under the category of flexible armor. If you want reasons why, we can have Terry write a guest post/rant on chain mail in boffer combat. Rigid armor must be made from stiff material. Either metal or hard plastic can be used as long as the plates are not flexible. Plates can be held together with flexible material. As long as rigid plates are going to get between a boffer weapon and a hit location, it will be counted as rigid armor. If players from practice are interested in making their own armor, we’ll cover armor construction for them in a later post. In general the armor should be made out of the actual material. Chain mail should be woven metal rings, preferably not soda tabs, aluminum, or other excessively modern materials. Plate armor should be made from plates of metal or rigid plastic. Leather armor can be constructed from leather scales or hides. Tweet me directly with any questions. Or comment on armor on the Google Plus page. Alternately check out the FB group post. And as always you can find me on Ello.co/larp.